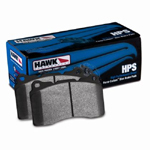 By offering a variety of friction compounds, the Posi Quiet Brake Pad program boasts the widest application coverage in the automotive aftermarket. Centric's Posi Quiet brake program has a brake pad for every vehicle and driving style. This item is listed for the front set only. Please note that these will ONLY work with the Brembo 328MM Big Brake Kit for the specified vehicle.